Britain, Anglo-Saxon, ca. AD 695 to 740. Continental type sceattas used in Britain. This type was minted in Frisia or the Rhine area, but is listed amoung British types because large numbers of them are found in Britain. These are often refered to as Porcupine sceattes, although the design that is similar to a porcupine is simply a derevation of a human head. 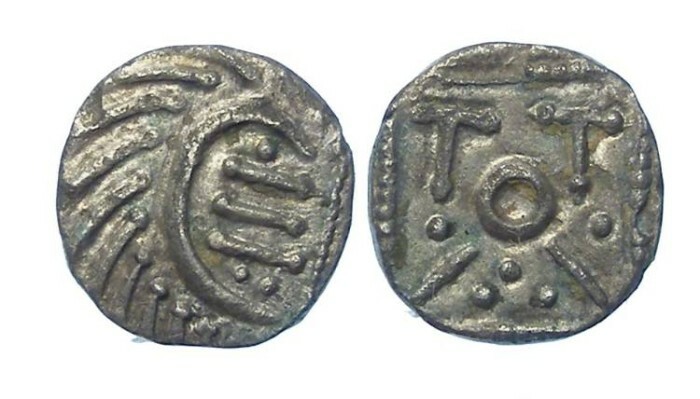 Mint : minted in either Frisia or the Rhine area on the Continent. Reference : Spink-786 (series D). Size : 10.1 X 10.5 mm. Weight : 0.78 grams. Grade : XF, small flan. Obverse : Porcupine like design derived from a Human head. Reverse : Standard, with a cross above, X's to the sides, and a TOTII pattern in the middle, but this specimen is struck on a small flan and the X's to the sides are off the flan. Provenance : ex. Balwins 10/04, 34. ex Patrick Finn.